It's the holiday season so who wouldn't want to add a little more stretch to their spending dollars? I know I sure take advantage of all the offers, sales, and specials around the holidays. And there's nothing better than buying something on your list and getting a little bit back on your purchase. 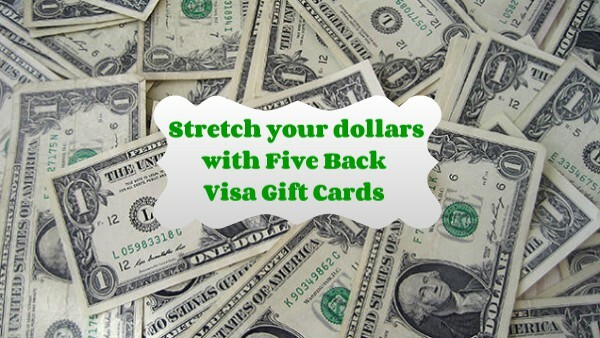 That's how Five Back Visa gift cards work. They are accepted everywhere Visa debit is accepted, and users earn up to 5% back to their gift card when they shop and dine with preferred restaurants and retailers! If you're already doing holiday shopping why not? It's what I like to call the "Spend and Earn" method. Kind of like a rebate, but you don't have to mess with the hassle of mailing it in and waiting weeks for you money to come back. With the Five Back Visa your earnings are deposited right back on your card ready for you to spend at your next stop. Win it: One lucky reader will win a $50 Visa Gift Card. This giveaway will end December 15th at 12:00 AM EST. Prize fulfillment will be made by the sponsor, I am not responsible for prize delivery or lost or stolen deliveries. Open to residents of the US. a Rafflecopter giveaway Disclosure: This is a sponsored post on behalf of Tatu Digital Media. I received monetary compensation or product(s) in exchange for my honest and unbiased thoughts. All thoughts and opinions stated are my own and are in no way influenced by my partnership with mentioned brands.